The star replaced the jugglers and living statues who often gather around St Paul's Church in Covent Garden to perform a selection of new tracks from the back of a truck. Thousands of people gathered in the cobbled piazza and got a grandstand view from the balcony of the market building opposite. Onlookers started gathering after they twigged the musician may be playing after spotting one of his flight cases. The truck - forming his makeshift stage - pulled into the square with stacks of speakers set up in front. 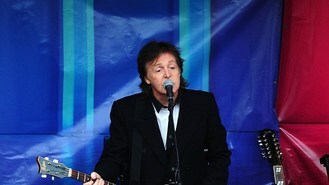 Stepping onstage at 1.30pm, he told the crowd: "Good afternoon, and welcome to Covent Garden. We're just going to do a few songs from our new album so get your phones out - as if they weren't out already." After playing current single New, he joked: "Busking - I've always wanted to busk here." Sir Paul memorably performed with The Beatles in January 1969 on the roof of the group's Apple HQ in London's Savile Row. Today's performance follows a whirlwind week of promotion for his latest album - also called New - which has involved intimate shows at BBC studios and numerous TV and radio interviews. Watching from the balcony of the nearby Punch and Judy pub were Sir Paul's children - fashion designer Stella and musician James - who later joined their father backstage. During the 20-minute set, he also played newly recorded songs Queenie Eye, Save Us and Everybody Out There. Sir Paul said: "This is a bit of a change from the 60s - we'd have just been coming back from the clubs right now, never mind singing." As he thanked the crowd, he finished the five-song set with a further performance of opening song New.